I love chicken cacciatore. The blend of chicken, onions, garlic and rich tomato sauce is just amazing, but most recipes call for bone-in chicken and simmering all day. I just don’t have that kind of time. 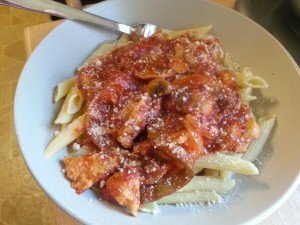 My husband is huge fan of chicken parmesan, which is also a pain to make from scratch and requires breading and frying. Not the healthiest thing in the world. One night, I came up with this recipe and it is now a staple in our household. It’s so fast, it’ll be ready before the huge pot of water boils. I actually put the water on first and the sauce was still finished before the water boiled. That’s just fine because that gives the chicken additional time to dance with the flavors in the sauce and that is always a good thing. Try this one if you want a hearty dinner on the table in the time it takes to make your penne. Fill a large stock pot with water and put over high heat. Don’t forget to salt your water! This is your only chance to season the pasta. 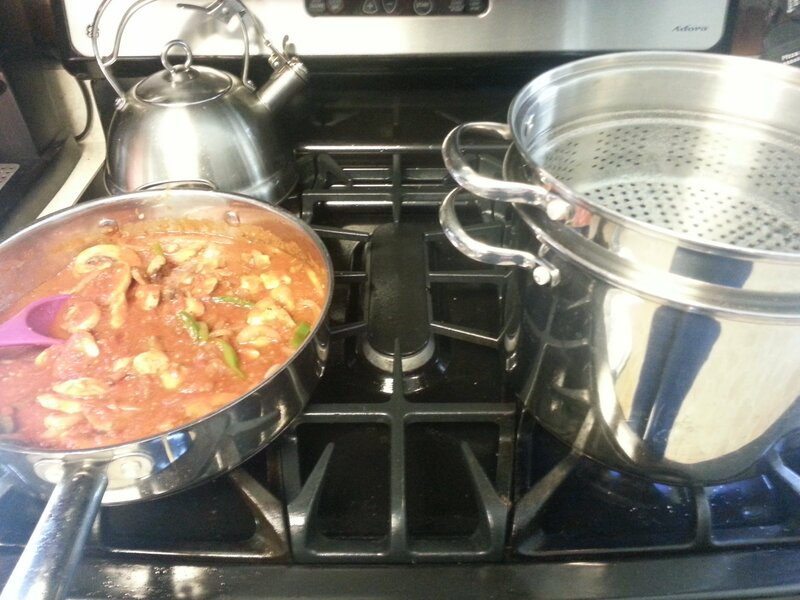 As soon as the water starts to boil, add the pasta and cook to your liking. I like a little bite in my pasta so I cook about one minute short of the recommendation on the box. Heat a large saute pan over medium high heat for five minutes. I always heat my pans for five minutes because by that time the pan is good and hot, plus the heat is evenly distributed over the pan. Add a bit of olive oil to the pan. Season the chicken with a bit of salt and pepper and add to the hot pan. Spread the chicken out so all the pieces will brown. Don’t stir the chicken. Just let it be. Most people complain about food sticking to stainless steel pans because they fidget with the food too much. Once the chicken gets a nice sear, it will release from the pan. I’m looking for nice golden brown color on the chicken. Once your chicken is well browned and cooked through, remove it from the pan. Now your onions, peppers and mushrooms. Turn the pan to medium heat. The liquids that release from the veggies will help get all the good chicken flavor off the bottom of the pan. Cook the veggies for one minute and then add the garlic. Stir everything together and cook for another 2-4 minutes. You don’t want the veggies to be completely limp. Add the chicken back to the pan with the wine, if using. Bring this to a simmer and let it dance until the pasta is ready. 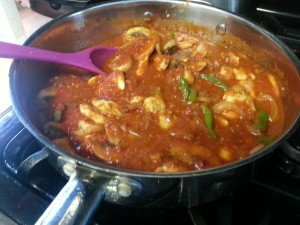 Serve the sauce over the pasta and top with a little grated cheese. After making up the leftovers, I had a bit of sauce leftover. I saved it for pizza. The flavor was amazing. If you have sauce leftover, save it if you want to make pizza. You won’t be disappointed. As I was writing this post, my husband looked over my shoulder and asked, “Are we having that this week?” I guess I’ll have to make it next week because this isn’t in the meal plan! *I usually cut the top off the pepper, then remove the seeds and slice the pepper in half. Then I cut from top to bottom into half inch strips. ** The sauce is key to making this work. 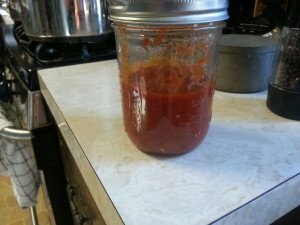 I use my own canned sauce most of the time, but when I’m out I love Capa di Roma marinara (if you live in Connecticut or Western Mass you can find it in a lot of grocery stores). Trader Joe’s marinara is excellent as well and very inexpensive. You could also use Barilla or any other good jarred marinara you like.